Miami Club Casino Review - Join the club today! Slick looking online casino with solid gaming platform. Good range of casino games available. 100% match bonus on first eight deposits. Join Miami Club Casino Today! Miami Club Casino is another new casino US facing casino regulated in Curacao. When you go on their website it really looks the part with stylish graphics and the promise of an $800 match bonus. With one Craps game available this review will give you some idea on whether or not to include it into your casino collection. Here you can first find a brief overview of the company followed by a full review of the Craps game on offer. This includes the look and playability of the software along with the bets on offer. After this the available bonuses are looked at before mentioning the other games you can play on. Finally banking options are covered and the customer support is checked out. Miami Club Casino is licensed by the Government of Netherlands Antilles and owned and run by Deckmedia N.V which is based in Curacao. 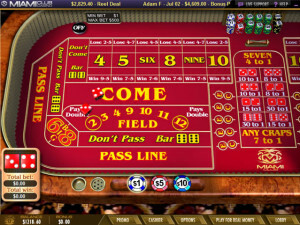 The site uses WGS Technology software, formerly Vegas Technology, to power its casino and the package brings a wide choice of slots and table games. Initially launched in 2012 Miami Club Casino accepts US and worldwide players, although a few countries, notably Canada, do have restrictions. While there is an offer of a free $10 to players again this is restricted in certain countries. 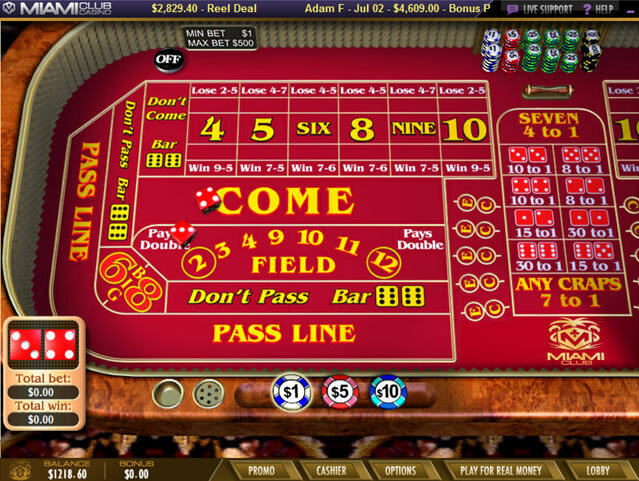 Miami Club Casino offer a single Craps game found under the Table Games tab in the main lobby. This game is available on both the downloadable client and the Flash ‘Instant Play’ client, although during a single small session I found the latter to be slightly buggy and prone to crashing. The graphics are very clear and the table shows all the familiar betting areas. As you move your mouse around the different sections you can bet in are highlighted which is helpful if you are new to the game. To add a bet you can just click on the chip denominations at the bottom of the screen then on the area you wish to place the wager. To remove any live bets just press the Clear button. You can bet between $1 and $99 in each section, and the table-limit goes up to $500. Unlike most online casinos there is no further information on the bets when you hover over them, such as maximum allowed and odds for specific bets which are not printed on the table. This becomes a particular problem when your pass line bet is removed after the come out roll and it is not clear if you can bet the odds or not. As this is the best bet on the table missing this seriously damages a players potential of a win. Unfortunately I was unable to find the answer and the support was of no help, so I can only assume this bet is unavailable. Other less attractive bets are marked on the table including Field bets which pay out at even money apart from 2’s and 12’s which pay 2:1. The standard place odds and proposition bet odds are also clearly marked on the table. Miami Club Casino offers a 100% match on your first 8 deposits of $100 or less. Unfortunately this is only available for slots games and Craps play does not go toward clearing it. If you do wish to clear this there is a play-through requirement of 40x the total of deposit and bonus. As a Craps player can benefit slightly from the casino’s Loyalty program. Each time you bet Miami Club Casino lets you accumulate points and every 1000 can be converted into $1. The value here is a bit thin however as Craps games only award between 6-14 points per $100 wagered, depending on your VIP level. This means even at the highest level, by just playing Craps, you have to bet over $7000 to gain $1. What Else You Can Play at Miami Club? The WGS casino package Miami Club uses hosts over 80 games, with many 3, 5 and 7 reel slots as well as a large selection of table games. Several Video Poker games can also be found here with Deuces Wild offering up to 100 playable hands every deal. There are several deposit and withdrawal options available at Miami Club Casino, although US players in particular may be somewhat limited. Credit and Debit cards deposits are the most reliable and easiest options for most players and international players can also use e-wallets such as NETeller. While most international players can withdraw funds by the same methods they deposit, with the exception of credit cards, the difference really begins to show for US players who can only get money out via Wire Transfers. Not only does this typically take a longer time to clear, there is a huge $45 charge for each transaction. Withdrawals are also restricted to a minimum amount of $100 up to a maximum of $2000 per week, which is not good if you have either a small or large balance you want off the site. The site does provide 24/7 customer support via email, live chat and a toll free US telephone number. There have been complaints about the speed and friendliness of the staff and although the live chat session I had was friendly enough, it was painfully slow and unhelpful – taking over 5 minutes to tell me “there are numerous bets in Craps” when I asked a specific question about betting the odds. While the game on offer is attractive and entertaining – Miami Club Casino offers very little for Craps players who enjoy more than the occasional game, mixed in with other casino betting. There are no bonuses which apply to Craps and the loyalty program is essentially worthless. Withdrawals for US players suffer large fees, even if you do have an amount you are able to take out. Worst still it appears one of the best bets on the Craps table is simply not there and the support staff appear uneducated about the game. | Miami Club Casino Review - Join the club today! Missing some Craps betting options. Extremely high withdrawal fees for US players. Loyalty program virtually worthless for Craps players. At times customer support has been slow and unhelpful.